Some animals discovered in the fossil beds of Kansas. LEFT: A drawing of Dolichorhynchops osborni by S.W. WIlliston, Fig. 42 in "Water Reptiles of the Past and Present"
Wherein Charles Sternberg describes the fossils which he and his sons have collected from Kansas, including several large Pleistocene mammals, and indicates where they were sent. See more about Charles H. Sternberg here. By CHARLES H. STERNBERG, Lawrence. Kan.
For many years past the writer of this paper has given his entire time to the collection and preparation for exhibit of fossils from several Western states, giving much time to the rich fields of western Kansas, so prolific in fine examples of ancient vertebrate life. Some mention of some of the best finds made within the last few years and where these have gone, many being lost forever for any Kansas museum, is worthy of record. 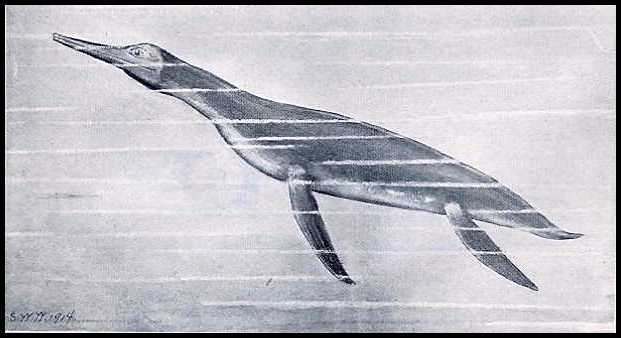 A complete skeleton of a new plesiosaur was found by the writer's son on the Hathaway ranch, on Beaver creek, Logan county, and which is now in the museum of the University of Kansas, having been mounted by the very competent preparator, Mr. H. T. Martin. A nearly complete skeleton of Portheus colossus [sic], of Cope, collected on Robinson's cattle ranch, in Logan county, within stone's throw of the stable, is now mounted in the American Museum, at New York, and is said to be the best example of a fossil fish in any museum in the world. There have also been sent to this museum from the Kansas fields eight other splendid specimens, including a very fine skull of the great ram-nosed Tylosaurus and the skeleton of a smaller form of Portheus. This has enabled that museum to restore and mount a nearly complete skeleton procured some years ago from Mr. W. O. Bourne, of Scott City, Kan., in which the head was distorted. This fine skull was found on Butte creek, 100 feet above where the writer had previously, in 1881, found as good a one, which is now in the Museum of Comparative Zoology, at Cambridge, Mass. To Vassar College was sent a fine skeleton of Clidastes and also one of Platecarpus, both from Logan county. To the Carnegie Museum, at Pittsburg, Pa., much material has been sent, including the most complete skeleton of Protostega ever found in the Kansas chalk- beds. This great turtle measured ten feet between the front paddles. There was also sent this museum a fine skeleton of the great predaceous fish, Portheus colossus [sic]. included a fine pair of fins with pectoral arches connecting them of the well-armed snout-fish, Protosphyraena. Each fin, enameled and sharp as a knife, with forty teeth; is three feet in length. What must have been a strong and effective weapon of offense or defense is shown in a skull of this same fish, with its long, bony rostrum, oval in section and terminating in a sharp point. In addition to this dagger, fixed at the end of the head, the snout-fish possessed eight sharp, lancet-shaped teeth that projected forward. When the sharp point of the rostrum was driven into the victim's side these lancets widened the rent, till the animal's head could be forced into the breach up to its eye-rims, while their forward slant enabled the head to be quickly withdrawn for a fresh attack. Even the Kansas mosasaurs, who were no mean fighters themselves, must have avoided this great fighter among fishes. A nearly complete skeleton of this same lizard is displayed in the museum of the University of Iowa. This was a large specimen, twenty-five feet in length, with the bones well bedded in the natural chalk. The finest saurian ever found on any of the writer's expeditions came from the Mendenhall pasture, on Hackberry creek, in Gove county. The specimen was complete, except for the upper portion of the head. The massive jaws are present, and the bones generally are beautifully preserved, and so little distorted by pressure that the specimen can be given an open mount. Even the breast-bone and the cartilaginous ribs are present, this being the first time that these bones have been found in the remains of this animal. This fine specimen of Platecarpus coryphæus was sent to the Roemer Museum, at Hildersheim, near Hanover, Germany. The first restoration of a Platecarpus skeleton ever attempted in the United States, the material being from Kansas beds, was sent to Doctor Krantz, a dealer of Bonn, Germany. With this went the material for an open mount of the Kansas rhinoceros, Teleoceras fossiger, from the Sternberg quarry, near Long Island, Kan. There has been sent to the Munich Museum a complete set of lower jaws and also a number of inferior tusks of Mastodon productus ( Cope). 124 Kansas Academy of Science. specimen, it proved so complete as to destroy nearly thirty synonyms used to name the animal, and derived from many teeth found at various former times. In addition to the above-mentioned vertebrate fossils, the writer has gathered many of lesser perfection or importance, as well as everything that came in his way illustrative of the life of former geologic times. The beds of Kansas have proved to be rich territory and to possess material of very great scientific interest, as is evidenced by the desire of the various museums mentioned above to secure fine illustrative examples of this ancient Kansas fauna. The discovery and collection of these has been a constant source of joy and pleasure, entirely aside from any financial value they hold. On the other hand, it has been a very great disappointment that these things, of such great scientific interest, had to leave the state. Instead of finding a natural home at the University, the museums of the capital, or with the educational institutions of the state, they are scattered in other states, or even across the sea. Moreover, the finding of each new and valuable specimen reduces the probability of finding more in the years to come. The writer has tried to bring to a successful issue several movements through which the results of his collecting expeditions in Kansas would remain within the boundaries of the state - within the district where the huge and strange forms lived their lives. To his regret he has so far failed.